It was Robert Redford, the erstwhile Sundance Kid, who was the first person to mention the Outlaw Trail to me. I was interviewing Redford at his Sundance Resort in Utah a few years ago when he pointed to the long, ornate wooden bar with massive mirrors in the resort’s tavern, known as the Owl Bar. Could there be a more fitting owner of this relic of Western lore than the man who played the Sundance Kid to Paul Newman’s Butch Cassidy? It’s not only a great bar, but I can’t think of a better place to drink a Polygamy Porter and ponder what Redford had spoken of. The conversation piqued my interest in the real Butch Cassidy and the Sundance Kid, their gang that was known as the Wild Bunch, and the legendary Outlaw Trail. That poetic name started getting currency in the mid-19th century, when robbers and cattle rustlers borrowed — OK, let’s say stole — an idea from the Pony Express. They would leave fresh horses and the necessary supplies in hideaways and so-called outlaw ranches that were about 20 miles apart. It was an irregular trail of supply stations, veritable safe houses in today’s speak, that stretched for about a thousand miles, from Montana to Mexico. Hence the Outlaw Trail. The hideaways took advantage of the dramatic geology of the West, making full use of narrow canyons, high pastures and great open spaces that lawmen couldn’t possibly hope to cover. The Outlaw Trail still exists, though much of it remains rugged, remote and hard to access. What’s left has been worn by time and nature, but once you get out there, you may come upon weather-beaten cabins that were hideouts on the trail. You can follow it yourself, or parts of it, through the mountains, plains and canyon-lands of Wyoming, Colorado and Utah. Even if you aren’t as fortunate as Redford in unearthing a piece of Americana like Butch Cassidy’s bar, you can catch the essence of the West. Those words seem more fitting than ever in this age of Twitter and Facebook. Butch Cassidy has always had the aura of outlaw-as-hero, often thought of as an Old West Robin Hood, who took umbrage at the idea that large cattle outfits were squeezing the smaller ranchers out of business and were therefore fit to be robbed. The Utah-born Cassidy — his real name was Robert LeRoy Parker — was one of the first to really utilize and eventually improve upon the Outlaw Trail. Known for his charm, his wit and his bravery, Cassidy’s first known crime was robbing the San Miguel Valley Bank in Telluride in 1889 with three others. 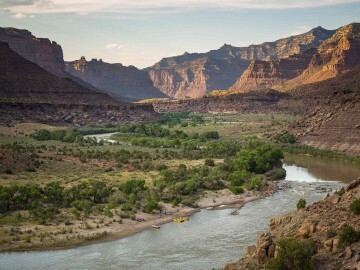 They rode away with $20,000 and made their way to Brown’s Park, a mountain-ringed valley along the Green River that straddles the border of Colorado and Utah just south of the Wyoming line. As early as the 1860’s, outlaws had been using this isolated bowl of grassland to pasture stolen horses and cattle and to hide out from the law. Cassidy and his gang traveled along the Green River before moving on to Vernal, Utah. 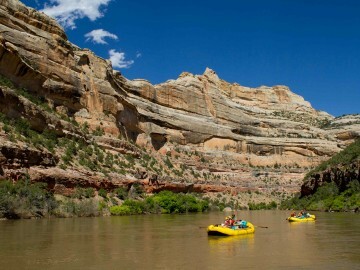 Brown’s Park begins in eastern Utah, about 25 miles downstream from Flaming Gorge Dam, and runs down into Colorado, ending at the Gates of Lodore in Dinosaur National Monument. Herb Bassett had built a ranch in Brown’s Park and had business dealings with Cassidy and the Wild Bunch. The Basset Ranch was the birthplace of his two daughters: Ann Bassett — known as Queen Ann Bassett — and Josie Bassett. Trained in riding, roping and shooting, but also provided with an education in boarding schools, the girls became outlaws, as well as girlfriends, to Butch Cassidy and other members of the Wild Bunch gang. The “Wild Bunch” were so-named by saloon keepers in the town of Vernal, who knew a bunch of hell raisers when they saw them. This gang consisted of Harry Alonzo Longabaugh, known as the Sundance Kid; Harvey Logan, alias Kid Curry; Ben Kilpatrick, the Tall Texan; Harry Tracy, and Elzy Lays. The Wild Bunch are credited with the longest sequence of successful bank and train robberies in the history of the American West. Head to Vernal, where the Wild Bunch drank and raised hell, to start your exploration of the Outlaw Trail and the rugged terrain it passes through. 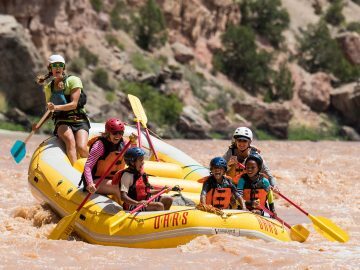 Today, you can explore this country on an OARS rafting trip that kicks off east of Vernal at Deerlodge Park, just over the Colorado border along the Yampa River. The Yampa is the last undammed tributary of the Colorado River, and it looks pretty much like Butch Cassidy would have seen it 122 years ago. The walls of the Yampa Canyon rise 1,000 feet up and can be streaked yellow, red or the black “manganese oxide” known as “desert varnish.” The sandy beaches, the Native American ruins and the ancient petroglyphs found here haven’t changed since Cassidy’s time. 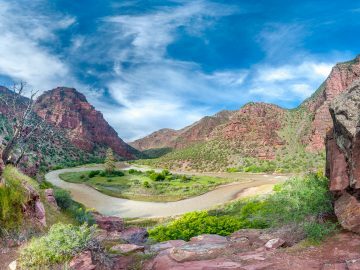 You’re in the heart of Dinosaur National Monument, arguably one of the richest, yet most overlooked corners of the West. The old cabins along the river are part of the trail. Of special note is Stubs Cabin, which was a homestead used by rustlers around the turn of the century. 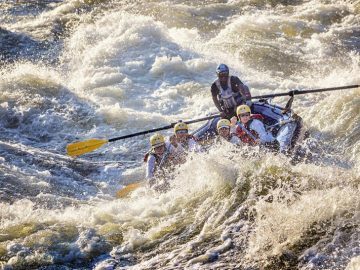 The most dramatic—in fact, you could say prehistoric—aspect of the river run is Echo Park, where the Yampa River converges with the Green before flowing into Utah. The waters wrap around an enormous butte surrounded by cliffs. It was discovered and named by John Wesley Powell in 1869 during his first expedition into the Colorado Plateau. It is one of the most profound vistas in the West and surely one of the most evocative places along the Outlaw Trail, a perfectly preserved bit of the wild country that the Wild Bunch operated in. 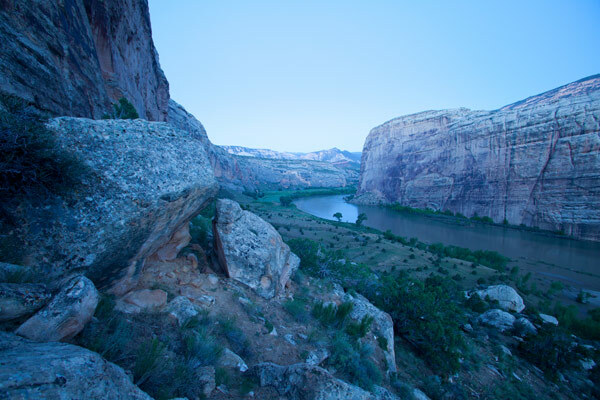 You can find other traces of Butch Cassidy and the Wild Bunch nearby, such as Desolation Canyon along the Green River, where Cassidy and the Sundance Kid hid out at the McPherson Ranch, which still stands. The John Jarvie Historic Property, now overseen by the Bureau of Land Management, sits alongside the Green River and is worth a visit. Jarvie was a Scottish immigrant with a beard of Biblical proportions who ran the valley’s store, post office and ferry crossing and he was well acquainted with Cassidy, the Sundance Kid and the Hole-in-the-Wall Gang. He was murdered by a pair of ne’er-do-wells in 1909, and now his stone house is a museum displaying some great Brown’s Park memorabilia. You can also check out Crouse Canyon, which was regularly used by rustlers and outlaws riding between Brown’s Park and Vernal, Utah. You can explore nearby Diamond Mountain Plateau, a sparse benchland with remnants of log cabins and corrals. The area known as the Outlaw Pasture served as grazing land for livestock purloined by the Wild Bunch. Further afield, in southeastern Utah, is Robber’s Roost, a place where fresh horses were kept, along with a substantial cache of weapons. It was a labyrinth of canyons that offered a variety of lookout points, so it became one of Cassidy’s favorite places to lay low. Cassidy’s original corral remains in Robbers’ Roost, as does a stone chimney and the caves where they could hide out. The terrain and the extreme heat of the region are cited as the primary reasons that the law never was able to root out any outlaws from here. In time, the Hole-In-The-Wall, in the Big Horn Mountains in northern Wyoming, would probably become the gang’s best known hideout, a natural geological formation which afforded the Wild Bunch much welcomed protection. The log cabin that had stood there has been preserved at the Old Trail Town Museum in Cody, Wyoming. Eventually, the long arm of the law began to stretch into the remote hidey holes of the Outlaw Trail. When the railroads hired the Pinkerton Agency to chase them down, Cassidy, Sundance and the latter’s girlfriend, Etta Place, fled to South America and bought a ranch in Argentina. 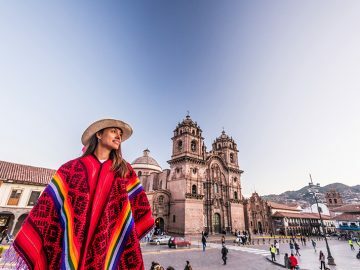 After a couple of years, they went back to what they knew best—robbing banks—until the pair were trapped by troops in Bolivia after a payroll robbery and were killed. Or were they? The legend persists that their deaths were faked and that they went underground again, with Cassidy heading to Europe and then back to his beloved Wild West. 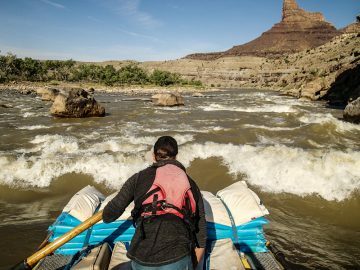 Whatever might have happened, it’s remarkable indeed that a rafting trip into a remote corner of the American West can transport you back a century, to a place and a time when only outlaws traveled in these parts. This essay was originally created for the 2012 OARS catalog. For more compelling stories from other renowned writers, request a copy of our most recent edition today! Everett Potter is the editor and publisher of Everett Potter’s Travel Report (www.everettpotter.com) and contributes to National Geographic Traveler, Afar, Travel + Leisure and Ski.